MASTERING ART: Penelope Gilbert Ng returns this winter for a one-day Pastel workshop at the Buderim Craft Cottage. FROM the talented to aspiring creative, the Buderim Craft Cottage's Winter Arts School has courses to capture the imagination and inspire the Coast's senior community. Running from July 6 to 14, the Cottage is bringing together 11 of Queensland's top artisans to share their insights and skills into their field of endeavour. On offer will be painting and drawing, pottery, textile and fabric art, silversmithing, embroidery, printing, and photography. Each of the 14, one or two-day courses are short and intense. From 8.30am to 4pm attendees will be treated to the personal touch of the course presenter. Group numbers are limited, but the level of talent is not. Anyone with any level of enthusiasm and passion will be welcomed said Cottage member Jan Nelson. Brisbane-based painter Penelope Gilbert Ng will host a Master Class in Impressionism Using Acrylics and Painting Pastel over Watercolour. Ms Gilbert NG was a finalist for the Archibald Prize and has undertaken many teaching assignments in Australia, including the prestigious McGregor Summer School and the Flying Arts programme. Silversmith Nick Murray will conduct both the Basic Silversmithing Skills and Locket Making with Hinges courses. Rich Johnston will be lead attendees through Photography Getting the Basics Right and then Creative Exposures. Ceramicist Dianne Peach will hold a Master Class in Hand-Built Ceramic Vessels with Hinged or Screwed Lids. Ms Peach has had many international and Australian exhibitions, including nine solo exhibitions. She is represented in the National Gallery of Australia, most State galleries, and many regional public and private collections. Other courses on offer are: Machine Embroidery - Diamond Delight Table Centre with Rhonda Chandler, Using Palette Knife Skills in Acrylics or Oils with Todd Whisson, Natural Dyeing Techniques on Fabric and Paper with Lara Stone, Snippets and Embroidery with Jennifer Clouston, Life Drawing - Gesture as a Finished Art Form with Louise Corke, Learn the Dynamics of Drawing with Christine Clark, and Colour and Reductive Lino Printing with Kim Herringe. 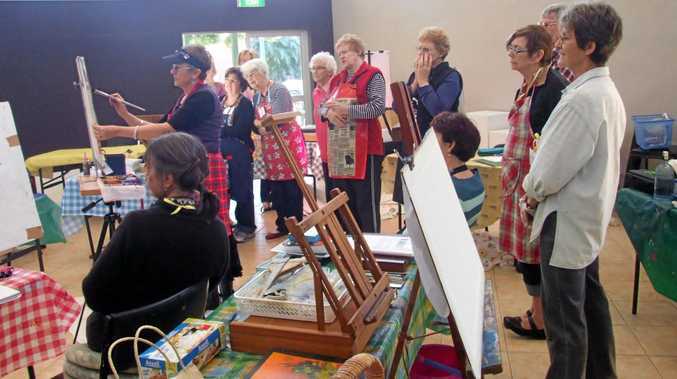 The Buderim Craft Cottage runs 13 craft groups during the year. Ms Nelson said men and women of all ages can enjoy the ongoing creative experience of the Cottage. Many of them display their works at the Cottage and make them available for sale. Other Cottage members enjoy sharing their art with favoured charities which use the works to raise funds.